Desktop purifiers present an interesting set of challenges. First, their relatively low price point introduces a lot of terrible, low quality, options into the mix. 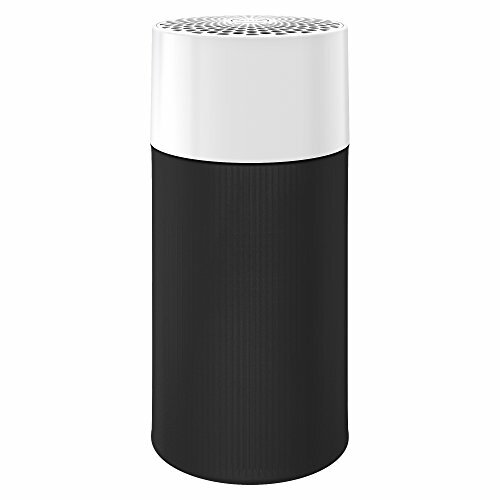 Second, a lot of desktop air purifier options are small (relatively speaking), but they’re small in the wrong dimensions. And third, few of them have filters that actually work. We’ll cover each of these issues below and offer some pointers on what to look for in the best desktop air purifier. But, first let’s look at some of the models that we’ve identified as suitable options. The Blue Pure line is a relative newcomer to the market. However, these purifiers are made by one of the older… more reputable names in purification, Blue Air. And, like their high end counterparts the Blue Pure line features everything you need to clean air… and nothing you don’t. Each Blue Pure purifier offers a true HEPA filter that removes more than 99 percent on PM 2.5 particles (some of the smallest and most hazardous to your health). A activated carbon filter backs up the HEPA to remove things like odor and VOCs, both of which pass right through any conventional filter element. Blue Pure also provides a prefilter to protect the HEPA filter and Activated Carbon from the big stuff like pet hair and dust bunnies. This extends the life of your filters, and when it’s dirty you can just rinse it clean in the sink. The pre filters are also what give the Blue Pure line thier color. The prefilter is similar to a fabric bag and is available in subtle colors as well as a few bold options. It’s a unique blend of design and functionality, and we think it’s one of the coolest pre filters you can find. These are great looking, and excellent performing purifiers. We would recommend one for pretty much any desktop application… especially if you’re limited on space. This purifier takes up very little space on your desk. This desktop air purifier from Levoit is similar in form and function to the Blue 411 (above). It has both HEPA and Activated Carbon filtration. It provides nearly the same footprint and height. However, it is only rated for about half of what the 411 can handle. And, it requires more electricity to operate. On paper they’re significantly different, but in use they’re fairly similar. At least to mild users (those without allergies, respiratory issues, etc.). For people in large, polluted cities, we’d definitely recommend the Blue 411 over the Levoit. But, if your needs (and budget) aren’t as big the LV-H132 will work well. Or perhaps a better way to look at it is… the LV-H132 will work better than pretty much anything else on the market. We’d take the LV-132 over the desktop purifiers from Holmes any day. They have “HEPA-type” filters rather than true HEPA filters. And, as we said… you just can’t beat true HEPA filtration. Plus activated carbon is almost a deal breaker in our book. Bottom line… the Levoit is not as impressive as the 411. However, it is a great option for the office. And, it’s more affordable than the 411… not by a lot, but if money is tight we could see opting for the LV-H132. When it comes to desktop purifiers, there aren’t many other units that really stand out (in our opinion). If you really need something that will sit on you desk we think you should go with the BluePure or Levoit we mentioned above. This purifier niche is just too crowded with junk purifiers. The purifiers we covered above are great for desktop (and countertop) use. We’d go as far as to say they’re the best for most scenarios. But, to be completely honest, they aren’t the only options for the office. There are a lot of viable purifiers available. But, many of them don’t provide enough value for the money. You may be tempted to spend about half of what the Blue 411 or Levoit cost, but in most instances they’re pretty rough. The cases, fan, and filters are usually pretty unimpressive. In cheaper examples you’ll find fairly rough, or thin, plastic casings. The units will also use a pretty weak fan in most sub fifty dollar purifiers. And, the filters are pretty useless. In fact, many purifiers will skip the HEPA filter and try to compensate with something like an ionizer, UV-C light, or in the worst examples… ozone. There are some passable, mediocre purifiers out there for people on a tight budget. But, dollar for dollar they’re nowhere close the Blue 411 we recommended above. Especially when size is part of your decision. Desktop purifier is a pretty limiting term. Anything you place on your desk needs to be fairly compact. We would recommend that the footprint is smaller than one square foot. For most cubicles and desks height is less important. Area is at a much greater premium for most of us. The exception would be if you have a desk with seats on the opposite side (e.g. human resources, director, executives). A tall air purifier might get in the way… blocking the view between two people. In those cases, we would opt for a more powerful and larger floor unit like an Air Mega, Coway, or Blue Air. But if we’re limiting ourselves to desktop or countertop use we’d limit our search to small footprint purifiers. Some manufacturers market purifiers as compact, if they’re height is small. But, that typically means that they need to spread out the purifier’s footprint. Here’s a good example of that strategy… in a purifier that we’d almost never recommend. Throughout our site we reinforce that the best purification comes from HEPA filters and Activated Carbon. That’s pretty much all you would ever need to truly clean the air you breathe. We briefly mentioned how bad some of the low cost desktop air purifier filters are. But, we wanted to expand on some of the things you’ll see in ads and marketing materials. HEPA style (or type) filters – True HEPA filtration is a government-regulated term and classification. To skirt stringent testing requirements, some manufacturers drop the “true” and add “style” or “type.” Now, some of them are fairly good copies of a true HEPA filter… but some are pretty terrible. Our recommendation is to make sure you’re getting a true HEPA filter. That way you know you’re filtering particles (99 percent of those measuring .3 microns or larger). Ionizers – Here’s another term that gets confusing. Especially on budget purifiers. Some ionizers do create Ozone… which is bad. Others are safe, and produce only charged ionic particles. Our recommendation; avoid low priced purifiers with ionizers. Or make sure that the ionizer can be deactivated. You can also check the California Air Resource Board directory for purifiers that are Ozone safe. UV-C Light – Here’s another one where a bad example can produce ozone. Those cases are fairly rare, but more often than not UV-C does not work unless exposure duration is fairly significant. Like ionizers we would recommend getting a purifier that does not have a UV light, but if it does make sure you can turn it off. Bottom line when it comes to filtration… get a True HEPA filter and Activated Carbon. Those are probably the only things you really need to get cleaner air in the workplace. Do you really need a Desktop Purifier? If you’re sharing a small or medium office with one or two others, we’d also point you in the direction or a floor or wall mounted purifier. They’ll cover that space much, much better than a desktop alone. And, their higher performance will benefit the whole team. Best of all… if you’re coworkers regularly bring in pungent lunches, a larger purifier (with carbon) will help keep the odor down. The one thing to look out for in a shared space is noise level. Something like a Honeywell 50250-S is probably a little too loud, and could get a little distracting. We would recommend looking at a larger BluePure, Alen, or Rabbit Air. They cost a little more, but they’re pretty quiet for how well the perform. And, a little white noise is great for covering up noises like keyboard clicks, sighs, or crumpling wrappers. These larger purifiers will also do a better job at catching “bugs” that might float around during cold and flu season. The only place where we really recommend a desktop purifier over other options is when your short on space and at a desk sitting in a wide-open area. It would be silly to spend a ton of money on higher end purifier to tackle thousands of square feet. You’ll be better off cleaning the air in your “bubble.” Just don’t expect too much from these tiny machines.